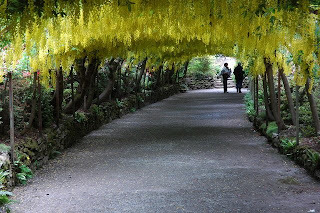 or important gardens which deserve highlighting - and are going on my 'to visit' list. 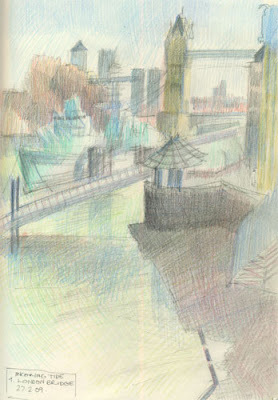 You'll also find some of my sketches providing some visual interest on a number of the sites! 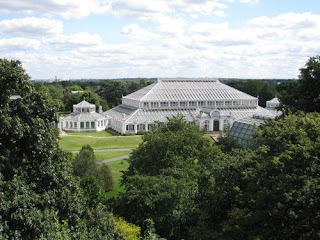 Over a million people visit the Royal Botanic Gardens at Kew each year. The 300 acres of gardens and botanical collections are a UNESCO World Heritage Site, which means they rank alongside Stonehenge, the Pyramids, and the Taj Mahal! Wisley Garden, in Surrey, is the flagship garden of the Royal Horticultural Society and is probably the most visited garden in the UK after Kew Gardens. For garden designers, Munstead Wood in Surrey is one of the most famous gardens in England. It was the home of Gertrude Jekyll who is renowned as a plantswoman. She created ways of planting which were very innovative in their day - and the garden at Munstead Wood was one of the places where she tried out her ideas. Sissinghurst Castle Garden in Kent is probably the most famous 20th century garden in the UK and is an English Heritage Historic Garden Grade I. It's also recently been the subject of a BBC Documentary series. It's one of my favourite gardens for the sheer variety and yet domestic scale. 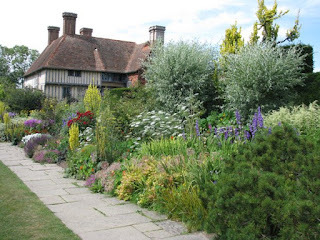 Great Dixter in East Sussex was created by Christopher Lloyd and is a garden which is extremely popular with plantsman gardeners - those who particularly like plants and flowers. It's also quite close to Sissinghurst. The gardens at Tatton Park in Cheshire are rated as being among the most impressive in England. Tatton Park has also been the the home of the RHS Flower Show since 1999. The 50 acre gardens are laid out in a traditional Edwardian fashion around the mansion home of the Edgerton family. Both are located within a 1,000 acre deer park. This is a garden I often used to visit as a child and that I now return to as an adult when visiting family. Giverny is a very famous garden created and painted by Claude Monet. When I visited Giverny for the first time I was immediately struck by the fact that Monet did not only create art with oils. The Château de Malmaison was the home of Napoléon's first wife - the Empress Joséphine and became the birthplace of the tea rose. The garden she developed included more than 250 varieties of roses and other exotic flowers from her native West Indies, and rare species from Australia. The catalogue of the garden became famous as one of the most exquisite publications of botanical art in the world. If you like any or all of the garden sites - or have visited any of the gardens - please leave can comment below or on any of the sites. You don't need to be a member of squidoo to comment. The NHS is rather good at implementing new computer systems that don't work well to start with. You'd think that after c.40 years the NHS would have learned a few lessons about systems implementation and what not to do. Sadly that didn't seem to be the case in April 2008 when chaos descended upon Barts Outpatients Service as they implemented a new system which was obviously not ready to go live in terms of staff capacity, training and functionality. No beta testing with real staff, no parallel running - they just dived straight in! In the past I've managed support services which have included both the implementation of new IT systems and the complaints function and I'm a huge advocate of making a complaint if something is not working. No manager is ever going to be able to fix a system properly if they never get to hear what it's like from a customer/patient/client perspective. One of the real benefits for me of the visit to Barts was getting to walk up the very grand stairs to the Great Hall which has the most amazing (and enormous!) murals by William Hogarth. 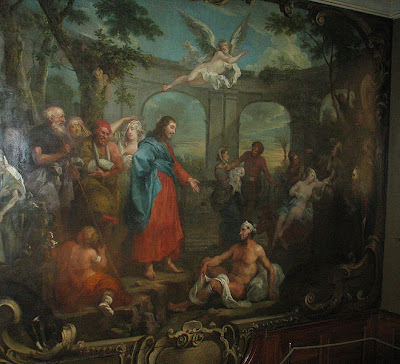 William Hogarth’s paintings on the staircase of the North Wing depict the Biblical stories of the Good Samaritan and Christ healing the Lame Man at the Pool of Bethesda, with the people in the paintings said to be modelled on real patients. The afternoon was then spent at the Bankside Gallery viewing the latest exhibition by Members and Associate Members of the Royal Watercolour Society. You can read a review of the exhibition on Making A Mark which I'm writing straight after I've posted this post! 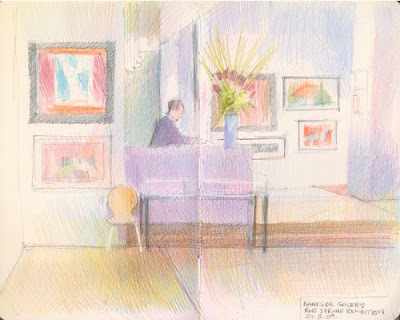 All the walls in the sketch at the top are in fact white - but the reception area when viewed from the end of the gallery is quite luminous and has an amazing combination of coloured whites which are most attractive to view - and to sketch. The figure behind the desk is Frank Kiely RE, who is an award-winning printmaker (producing mostly screenprints) and a member of the Royal Society of Painter Printmakers. He's also an amazingly helpful chap and we had a very nice discussion yesterday about how to get your (my!) head around linocutting! Frank also told me that there are going to be a number of print-making demonstrations at the Gallery associated with the Royal Society of Painter-Printmakers Annual Exhibition 2009 which runs from Friday 8th May to Sunday 7th June 2009 - of which more details later. Our scheduled RWS Sketching Day on Sunday was at the Science Museum in South Kensington to sketch but it was a such a lovely day in London that I opted for sketching outside. 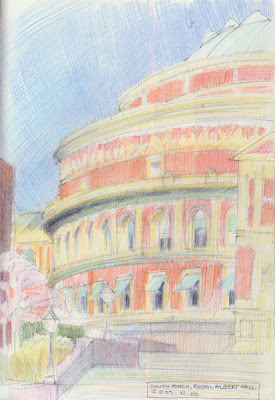 I ended up sitting in the shade on the steps of the Royal College of Music sketching the back of the Royal Albert Hall. Followed by sitting in the Cafe Consort in the Royal Albert Hall sketching the architecture Royal College of Music above where I'd been sitting. I can highly recommend the first stop for music while you work as the students had the windows of the basement music practice rooms open and I can cofnrim that get a very good standard of piano practice at the Royal College! It was an interesting day in relation to studying the impact of light on red brick. The first sketch of the Albert Hall was in bright sunlight and one of the Royal College was 'contre jour' with all the brickwork in shadow. We had lunch in the Blue Cafe at the far end of the Science Museum. There's lots to sketch (the Apollo 10 command module 1969, Stephenson's Rocket locomotive 1829 etc) - just not a lot of places to sit to sketch out of the way of people on the ground floor. I should think week days might be quieter. I came home with a present from the Science Museum bookshop for "he who must not be bored while I sketch or watch art programmes" - a facsimile copy of an Eagle Annual with a selection of highlights from the 1950s! 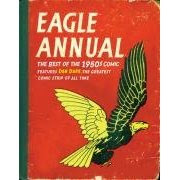 I too used to read the Eagle comic when I was little - Dan Dare rules OK?! 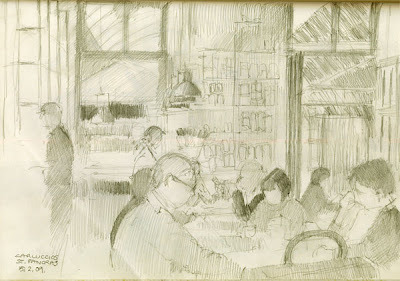 I always enjoy sketching interiors of restaurants and this was the one I did over lunch with the RWS Friends Sketching Group on our visit to St Pancras last month. Of course people were coming and going the whole time and the only thing that stood still was the structure of the room! 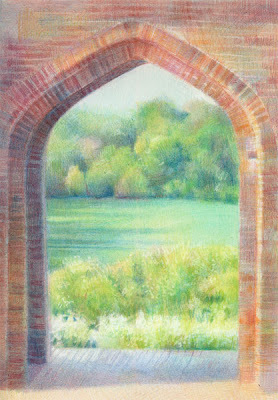 This is a view I love every time I visit Sissinghurst - of the fields seen through the arches of the great Elizabethan Farm. 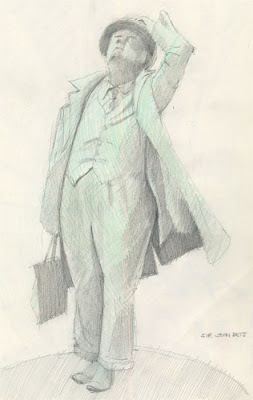 I don't often put formal completed drawings on my sketchbook blog but this one seemed appropriate. Regular readers will know I love travelling with my sketchbook to sketch in gardens and that one of the gardens I love drawing is Sissinghurst in Kent. I've updated my information site Sissinghurst Castle Garden - a great garden to include links to the BBC iplayer and the first six episodes of the new BBC4 documentary Sissinghurst. I'm certainly looking forward to trying the new salads and food from the farm in the revamped Barn Restaurant when I start my sketching visits this year. 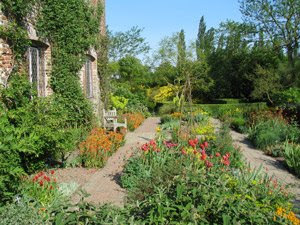 Sissinghurst garden opens for the 2009 season today - Sunday 15th March. It's now open from 11am to 6.30pm from 15 March to 2 November 2009 every day of the week except for Wednesdays and Thursdays. 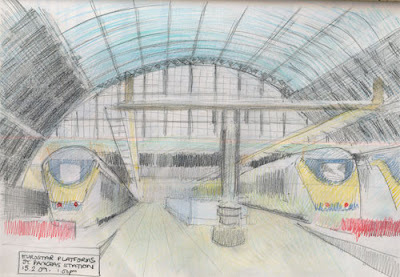 Continuing the visit by the RWS Friends Sketching Group to St Pancras Station, this is the sketch I made of the Eurostar trains from the end of their very long platforms. Only one of them pulled out of the station before I'd finished! The station has a very long history and is associated with some celebrated architecture. St Pancras is often termed the ‘cathedral of the railways’, and includes two of the most celebrated structures built in Britain in the Victorian era. The main train shed, completed in 1868 by the engineer William Henry Barlow, was the largest single-span structure built up to that time. The frontage of the station is formed by St Pancras Chambers, formerly the Midland Grand Hotel (1868–1877), an impressive example of Victorian gothic architecture. Its main purpose, until recently, was to act as the southern terminus of trains arriving from the cities of Leicester, Nottingham, Derby, Sheffield, and smaller towns in between. However, in recent years it has had a major makeover and was re-opened in November 2007 with a new identity as St Pancras International - the London station which is now home to the Eurostar trains which travel to Europe via the Channel Tunnel. The Eurostar enables people to take a train direct from London to Paris, Brussels or Lille - and at certain times of the year direct to Avignon and Disneyland Resort Paris. I hadn't realised they did a direct train to Avignon - I shall have to go and study the prices! At this time of year there is also a ski train direct to the French Alps. You can check out more details of how to travel at the Eurostar website and also see all the other places it's possible to travel to using connections. 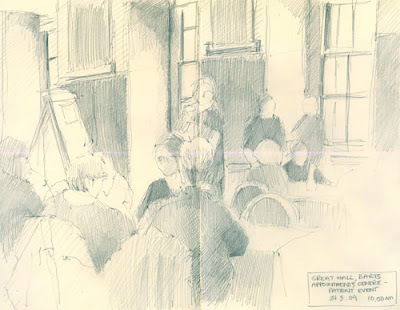 In February the RWS Friends Sketching Group visited St Pancras Station for our monthly outing. I realised that I'd not been to St Pancras since all the construction work for its new role as St Pancras International - the London based terminus for the Eurostar had been completed and the visit was quite a revelation! I've got three posts about the trip starting with this sketch. We all had to meet by the very splendid Sir John Betjeman statue which is at the platform level above the amazing collection of shops which now inhabit the Undercroft. He's a bit bigger than lifesize and is cast in bronze which has patinated to a lovely turquoise colour. It's a very popular statue - this is the sketch which excludes all the people who came up to get their photo taken standing next to him and it's also minus the teddie bears that one very silly man kept trying to stuff into the space made by his arm! Sir John Betjeman was instrumental in saving St Pancras station as he was a huge fan of both Victorian architecture and trains. He was also the Poet Laureate and most people's favourite poet for quite a few years. He became Poet Laureate in 1972, and this combined with his popularity as a television performer ensured that his poetry eventually reached an audience enormous by the standards of the time. Like Tennyson, he appeals to a very wide public and manages to voice the thoughts and aspirations of many ordinary people while retaining the respect of many of his fellow poets. This is partly because of the apparently simple traditional metrical structures and rhymes he uses (but not nearly as simple as they might appear). Here are some articles written about him at the time St Pancras reopened after its Eurostar update. and this is the website of Martin Jennings, the sculptor who created the statue - with some photographs of process and comments. 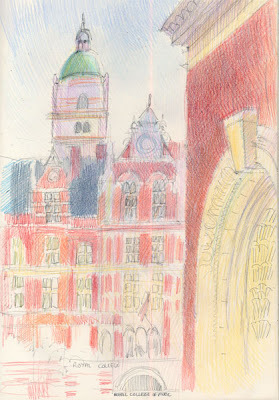 More sketches from St Pancras to come. This is the view looking east from the southern end of London Bridge - right next to the rather impressive building at No 1 London Bridge which houses the offices of PricewaterhouseCoopers. Parts of the foreshore were exposed but the tide was coming in quite fast while I sketched. This sketch, as always, has to be done standing up because of the height of the bridge 'walls'. I usually have a time limit of about 10 minutes for standing which I think I might have stretched a bit! Which could of course be the reason why, a minute after I left this spot, I took a tumble down the steps to Borough Market on the other side of the road (see the previous post). I'm way behind with posting my sketches so I'm starting near the end and working backwards! 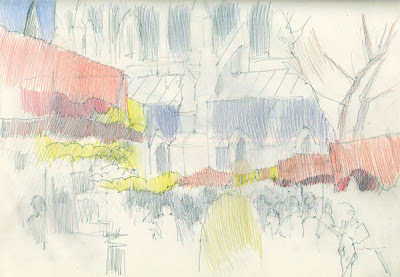 These are a couple of sketches which I did on Friday when I visited Borough Market, next to Southwark Cathedral, with the Drawing London Group. I should have remembered to take my sketching chair with me but the failure of my laptop that morning made me late setting off and I forgot. Standing sketches are limited to either 10 minutes max or can only be done when resting against a suitable bollard - such as the one on the right! Fortunately I found a friendly stall holder with a trolley for the sketch at the top! I've got more sketches - for later in the week. It's worth noting that Southwark Cathedral has a very nice refectory which is a bit difficult to find but is a great place to have sit down and a bowl of soup after a hard morning's sketching! 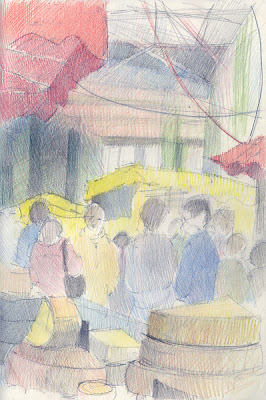 One nice additional twist to sketching at Borough Market on a Friday is that you can do the weekend food shopping before you go home. Last night we had cod fillet landed at Whitby in North Yorkshire (from the mega fish stall) from Furness Fish and Poultry. Tonight I'm doing a pot roast with some very nice looking brisket from The Ginger Pig who are free range farmers and butchers of rare breeds. These are the details and opening hours of the Ginger Pig Market Stand. Apparently they now also have a Hog Blog! Plus fruit and veggies from assorted stall holders. I could only stand and look at all the wonderful cheese as the "soon to be slimline me" likes her cheese a bit too much and isn't allowed any right now! There is yet another twist to this tale - which generated the title for this blog post. People who know me also know I have very dodgy feet (I've got a tissue disability which has led to a spontaneous ruptured instep among other things!) so I have to be very careful as my balance is now very poor. Stairs are a nightmare and you can normally find me hugging the handrail. This time I ignored all my normal risk management techniques and took a purler down the last four steps of the steps inbetween Southwark Cathedral and Borough Market. Luckily I was OK as it could have been a lot worse. Except last night in the bath I found that the bruises have now come out and certain areas of my anatomy are now an interesting shade of blue and very sensitive! Borough Market - and how to get there (they have a great map). They're not marked on the map but it's not far from London Bridge and the Tate Modern.